Graeme McDowell's campaign ended in New Jersey on Sunday as he is taking the week off to be with his wife Kristin, who is due to tie birth to the couple's first child, a girl, by C-section today. Currently ninth in the race and holding down the last of nine spots via the World Points List, McDowell can only be pushed out of the team if Gallacher finishes in the Top-2 at Circolo Golf Torino this week. With the second FedEx Cup event, the Deutsche Bank Championship, not counting for Ryder Cup qualification, there is no way for Donald, Poulter or the eliminated Westwood to qualify automatically. McDowell clearly feels he has done enough to warrant his place in the side and while he wished Gallacher the best in Italy, commenting at The Barclays that a big result for the Scot would "throw the cat among the pigeons", he does not think he's a likely victim. Should Gallacher qualify, McDowell looks assured of the nod, leaving McGinley to choose between Donald, Poulter and Westwood for the remaining two spots. Poulter is also highly likely to get a wildcard given his record, his heroics at Medinah in 2012 and the fact that he has been hampered by injury more so than poor form. That would leave McGinley to decide between Donald and Westwood for the remaining wildcard. If Gallacher fails to qualify, he would be ahead of Donald in the pecking order on current form but as a potential rookie, he would trail in terms of experience. Westwood's elimination from the FedEx Cup playoffs on Sunday is the only problem for McGinley and the Englishman may well have to play in at least one European Tour event before Gleneagles — the ISPS Handa Wales Open the week before the Ryder Cup looks the most likely — to remain sharp if he is to be considered. McGinley is clearly a fan of Westwood's, as he said at the US PGA last year following criticism of the Englishman for his failure to convert a two-stroke final round lead in The Open at Muirfield into a first major win. “From what I know about Lee and being in Ryder Cup teams with him and competing against him, I can honestly say it makes me laugh when I see the headlines saying Lee Westwood doesn’t have the bottle and all that," McGinley said at the time. “Of all the guys in professional golf, he is right up there at the very, very top in having the most bottle. There is no question of him not having the fight for the battle. He has proved that many, many times, with the number of wins he has had around the world and his performances in Ryder Cup. “In the team room, you get to see a guy. You see a guy naked in the team room and you can sense where a guy is at and I can assure you that Lee Westwood has never, ever shown any weakness in that regard. Who will be the fall guy - Donald or McGinley? Luke Donald can have few complaints if he's driving a buggy rather than a Titleist in the Ryder Cup later this month. But while most observers believe it will be Lee Westwood and Stephen Gallacher who get the nod to joined Ryder Cup talisman Ian Poulter at Gleneagles, it may well prove to be a very painful decision for Paul McGinley. Could Langer be McGinley's "shock" assistant? 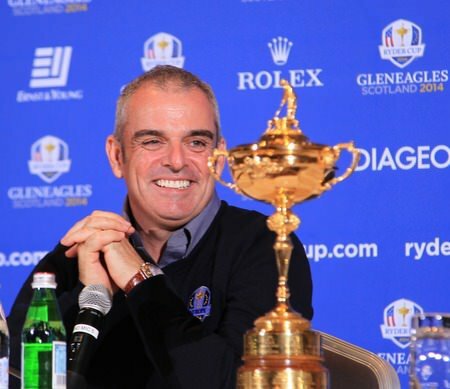 Paul McGinley surprised few with his wildcard picks and continued his so far impeccable Ryder Cup captaincy by choosing Scottish rookie Stephen Gallacher, Ryder Cup talisman Ian Poulter and veteran hard-man Lee Westwood to do battle at Gleneagles. McGinley goes for three wildcards and "flexibility"
European Ryder Cup captain Paul McGinley will have more flexibility with three wildcards. Picture Stuart Adams www.golftourimages.comComing as no major surprise, European Ryder Cup Captain Paul McGinley has announced he will have three wild card selections to complete his team for The 2014 Ryder Cup.